The PAW5 Rock ‘N Bowl is a great way to turn meal time into an enriching and rewarding challenge for your dog! What looks like a standard bowl is actually a unique puzzle feeder that will have your dog thinking, problem solving and having fun all at once. By adding environmental enrichment to mealtime, you turn a routine part of the day into a fun brainteaser. With our Simply Challenging design, just pour food directly into the top (as easy as a normal bowl), the food runs through a hidden compartment, and your dog has to paw, nudge, and play her way through mealtime (that’s the challenging part!). I think my friend’s dog would love it! I think my puppy will be very frustrated with the bowl, but not scared of it. He’ll work to figure it out! My dog likes to knock over his bowl, so I think he will think this bowl is entertaining. this would actually get used more by my pig and she will love it! At first my dog may be skeptical, however she will eventually go at it. 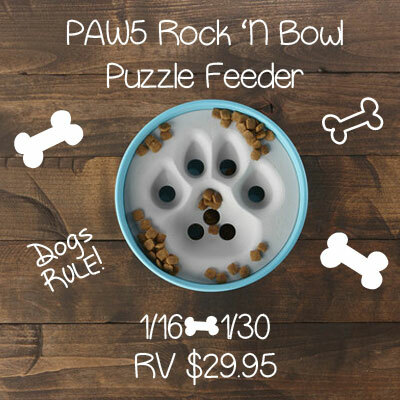 Our dog will like the PAW5 Rock ‘N Bowl Puzzle Feeder because he is inquisitive. Go at it. she’s a big lab. My dog will bark at it. She will love it! She will love go after it! I am wondering if my dog would get it. He isn’t so bright buy maybe he will like it. My dog will go right after it as long as what is in it is edible. As long as it doesn’t light up, my dog will go for it. She doesn’t like things that flicker or glow…found that out the hard way. my dog would go after it esp. if there is a treat reward.